A beautiful bright blue sky was the order of the day for my L1&2 Trial at Bournheath today but it was very cold. My judges were Ali Brannen and Sue Gardner and they soon decided which searches they were overseeing and with great efficiency got the areas scented up. We started straight after the judges’ briefing with the Level 1 folk. The standard was very high as can be seen by the fantastic scores. The judges gave feedback to all the handlers after every search which was very much appreciated. After lunch we had the Level 2 dog and handler teams running and again the competency and scores were very high. I’ll let the judges comment on the performance of the teams but I’d like to thank everyone for competing in this Trial and I hope you all enjoyed the event. Well done everyone and congratulations to the four folk who qualified with their Excellent Award today. I’d like to thank Ali and Sue for judging and to my fabulous team of scribes and runners. These were Jackie Hodge, Michelle Rodgers, Lisa Finney, Heather Poulton and Peter Jeffries. You were all brilliant. 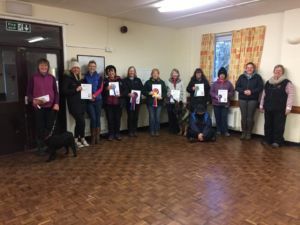 First I would like to thank Karen for asking me to judge her trial at Bournheath level 1 & 2 & Ali Brannen for sharing the judging. Also her support team, for assisting me and keeping me on track during the day, including Jackie who scribed for me all day. Level 1 – Having agreed the searches with Ali, I started judging tables and chairs and moved on to vehicle. There were 14 competing level one, and without exception, gave a text book search on tables and chairs with everyone finding the clove scent. 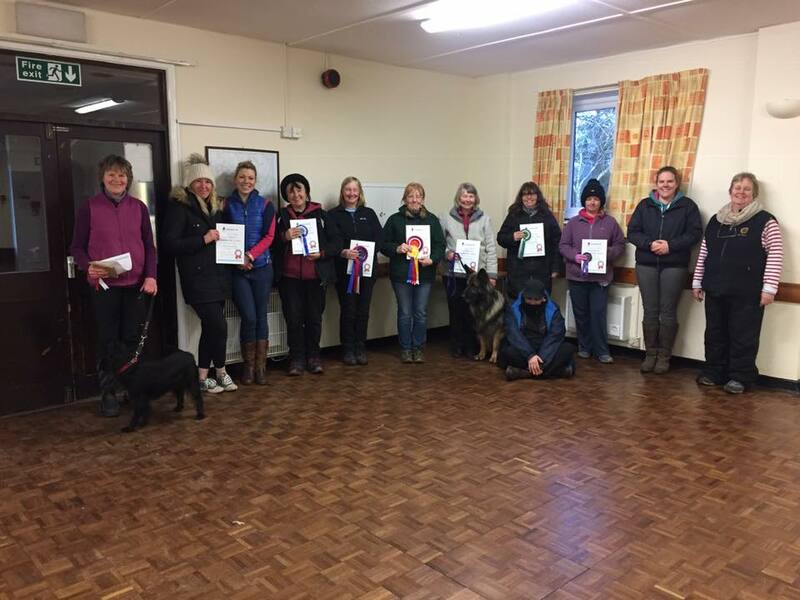 Times ranged from a very impressive 18 seconds by Charles and Breeze & 19 seconds for Mandy & Fred to a still impressive 61 seconds by Julia and Dandy. Conditions outside were a little fresh, making the vehicle search more challenging than my first search. However, Hazell and Teddy made it look easy setting a blistering pace of 14 seconds. Other impressive searches coming from Vicki & Easo and Julia & Spot both under 20 seconds. Level 2 – For simplicity Ali and I agreed to keep the same searches, however on level 2 we started with the vehicle search. The conditions had changed from the morning, the wind was now stronger making the search more challenging. Barbara & Joey stormed this search with an impressive 53 seconds and securing first place. Joanne and Zippy, living up to his name completing in a time of 56 seconds. Congratulations to those partnerships who secured a placing on both levels and also their excellence awards. Thank you to everyone for making this a fun and special day. I wondered what the day would hold when setting off at 6.45am in the snow, but was glad it turned out to be a clear, if cold day with no further snow or rain. I was charged with judging the Exterior Search and the Boxes & Luggage search. We started with the exterior search, and the scented article was hidden inside a vacuum head. The competitors were then given the choice of the 3 items it could possibly be. Well I expected to be outside for a while but these level 1’s weren’t hanging around. The first handler Gloria Bonnell & Jade proved this when they found the article in just 16 seconds, closely followed by Vicki Martin & Easo on 17 seconds and Harry Latusek & Zack with 17 seconds. Hazell Williamson swept in with a fabulous 9 second search but all were out done by Julia Reeves & Dandy taking a mere 7 seconds to find the article. It was nice to see Peter Jeffries & Coco again, proving that their teamwork just keeps on improving with each trial. Also Charles Robert and Breeze, Charles had to work very hard on herding Breeze around the search area to stop him sniffing the ground. Gill Douglas had her work cut out for her with a very distracted Drax, who quite fancied a bit of tape flapping off the wall and several piles of leaves, however her perseverance paid off and they were successful in this search. Mandy Wade with Fred decided she was going to attempt to work Fred off lead for the first time and was also successful on the search. Jane Page with Dinah fully investigated the exterior search including a few bits that weren’t in the search, but Jane worked hard with Dinah all day to keep the focus and again was another successful competitor. All dogs and handlers seemed to handle this search extremely well, there were a few distractions in the area, ground scent being the most obvious that I could see, but that didn’t faze any of the competitors, so well done everyone. My next search area was the boxes and luggage. The scent was hidden in a box at the back of the room. Julia Bodsworth & Spot handled this with style being the quickest at just 12 seconds. Sonia & the beautiful Ruby were consistent through all there searches, with Ruby being enthusiastic throughout the day. Julie Nelson & Ricco were a lovely pair to watch, I found out after the trial that Ricco was originally trained on Truffles, but had switched over beautifully to Cloves in an incredibly short space of time. Deb Atkins & Sklya also worked hard throughout the trial, Skyla not always making life easy for Deb, but Deb handled her very well, staying calm and trying to focus Skyla on the search at hand, nicely handle. A white dog was run in all search areas. So on conclusion it was a great day, and lovely to see you all and your lovely dogs. You all managed the day very well, with some lovely searches and great handling skills being shown. Well done to you all and I hope to see you all in the future. Also just to say thank you Karen for asking me to judge, and to my scribes and runners for keeping everything moving, also for the endless amount of coffee I was issued. After a morning of judging a level 1 trial, I was really looking forward to Judging the level 2’s and you guys didn’t disappoint. My search areas were the Exterior Search and the Boxes & Luggage. I started with Boxes and Luggage, one article was hidden in a box at the back of the search area, the 2nd was hidden in the side pocket of bag at the front of the area. Liz Beaumont & Chandra did a lovely search of the area, Chandra obviously is a real natural at this Scentwork malarkey and the pair were consistent all day. Jan Martin and Mattie were another nice pair to watch, Mattie is quite a timid fellow but Jan brought his confidence up in each search area I watched and he performed beautifully throughout the day. Another pair to watch was Barbara O’Brien and Joey, what a lovely boy. He was keen and accurate all day and they really were a pleasure to watch. Tracey Ley & Boo were also successful in this search, Boo was really up for it and although a little giddy at times, proved that Staffords are good Scent dogs. The next search was the exterior area. It was nice to see Linda Bowden’s Brewster had calmed down a little for this search and was more focussed on searching than ploughing through with great enthusiasm. 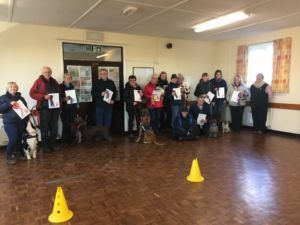 Sarah Melling and Ash worked enthusiastically throughout the trial, the areas I judged did not seem to pose a problem for him, he was fast and accurate, which is always nice to watch. Hazell Williamson & Teddy had stayed on from the level 1 trial to do their first level 2, both are very new to the sport, and although Teddy was slower in the afternoon he showed tenacity to get the job done no matter what, and was a pleasure to watch search. Julie Russon & Daisy also showed that a Level 2 search was a piece of cake, going on to win 4th overall. Collette Guy & Lola were successful in the exterior search also, although Lola wasn’t making things easy, but like any good handler Collette put it down to her nerves on the day (Haven’t we all been there!) Joanna Van Romunde & Zippy also worked their socks off throughout the trial, and will be a pair to watch for the future. The exterior area was getting a little scuffed up which made the job of the handlers even harder, a few dogs were really taken with the extra smells but the handlers encouraged their dogs to keep working the area until they were successful. Well done guys. On conclusion it was a great trial with most competitors qualifying, in at times some tricky areas, keep up the hard work guys and I look forward to seeing you all in the future. Thank you to Karen for asking me to Judge, my scribe and my runner. And to Peter Jefferies for coming back to help and keeping me stocked up on caffeine. Entry Fees: £21 per dog.